Showing capabilities of being one of the top softball teams in the 3A classification, Boulder City High School swept through two classified and one independent opponent 48-1 this week, advancing to 9-10 on the season. (Robert Vendettoli/Boulder City Review) Senior pitcher Abby Giunta throws a strike down the middle against Democracy Prep on Monday, March 25, 2019. Boulder City High School routed its opponent 16-1. The Lady Eagles routed Valley 17-0 on March 20 and Democracy Prep 16-1 on Monday, March 25, giving them a 5-1 record this season against 3A opponents. They defeated independent SLAM Academy 15-0 on Friday, March 22. Setting the bar high for themselves, the Lady Eagles lineup is on a midseason tear, highlighted by four runs batted in from senior Abby Giunta (2 for 3) against Democracy Prep and three RBIs each from sophomore Brooke Baker (3 for 3), freshman Samantha Bahde (2 for 3) and Reese (1 for 3) against Valley. Bahde batted 2 for 2 with three RBIs against Democracy Prep, while Reese batted 3 for 4 with two RBIs against SLAM. Junior Ellie Ramsey batted 1 for 2 with two RBIs against Valley to provide Giunta with plenty of run support on the mound. Generating three wins for the Lady Eagles on the mound, Giunta threw six innings total, allowing three hits, with three strikeouts. 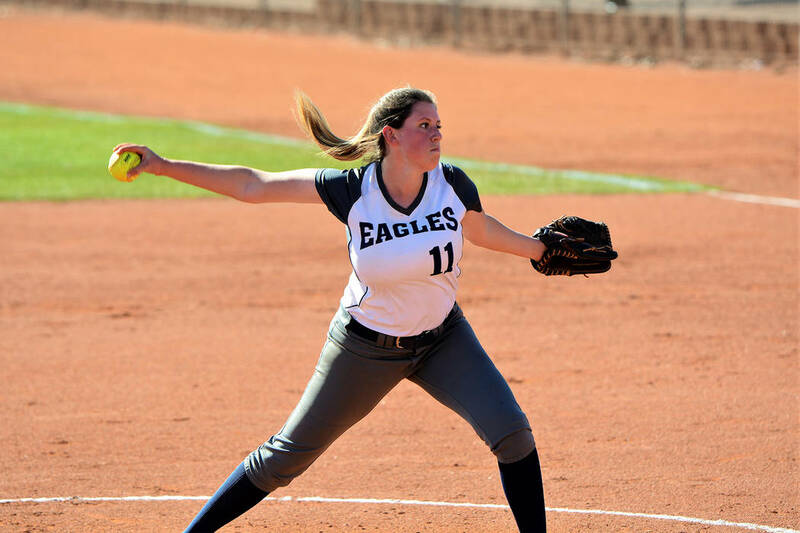 Picking up her ninth win of the season, Giunta has done well for the Lady Eagles in her first season as the team’s ace. Gaining on last test before league play begins Friday, March 29, Boulder City concluded this week’s slate with a 12-0 loss Tuesday, March 26, to 4A state contender Coronado in a tuneup game. Gearing up for the second half of the season, the Lady Eagles will travel to Chaparral on Friday, March 29, before hosting Sunrise Mountain on Tuesday, April 2.